Creamy Vanilla Cheesecake Pumpkinseed Topping – This is the recipe me and my mum made for two really good friends that came for a visit a few days ago. People who know me & had the experience of cooking with me know this: I love the combination of Vanilla & pumpkinseed oil. If it would be after me I would combine it for every dessert that I eat. Actually, I am not such a big sweet teeth but I could never say no to this. Especially for people like me how are after crazy and extra ordinary tastes. Someone who is really really close to my heart showed me this combo with Vanilla Icecream and Pumkinseed oil & I love it ever since. You can make it with any cream, popcorn, cake, ice cream warm milk – everything! So, as we wanted to make something really nice for our friends we went for this creamy vanilla Cheesecake Pumpkinseed oil combination. Mix the Flour, Egg, Butter, Sugar, Salt & the baking powder until everything is evenly mixed. Place a baking sheet in a 20cm to 15cm baking form. Press the dough thinly onto the bottom and the sides of the spring form. The more even & thin, the better. Put this into the fridge while you are preparing the rest of the cake. Mix the Butter, Sugar & Vanilla with a mixer until it starts to get really whipped, the more the better. Take specula and mix the Greek yoghurt or for the Germans the Schichtkäse (very funny word for Germans as well) under the egg butter mixture as well as the vanilla pudding powder. Add the mixture onto the cooled bottom. Bake this for 50 min. & IMPORTANT! – let it cool in the oven, so it does not get split or cracked. heat a pan and roast the pumpkin seeds until they start to get slightly golden. Add the vanilla powder & instantly add 2 tbsp of the sirup as well. Stir shortly & take the crumbles out of the pan and place it on a non-sticky surface, most preferably onto a baking sheet. Let this cool! DON’T touch it ! its hot like a volcano. In a small bowl, mix the 2 tbsp of sirup with the pumpkinseed oil. 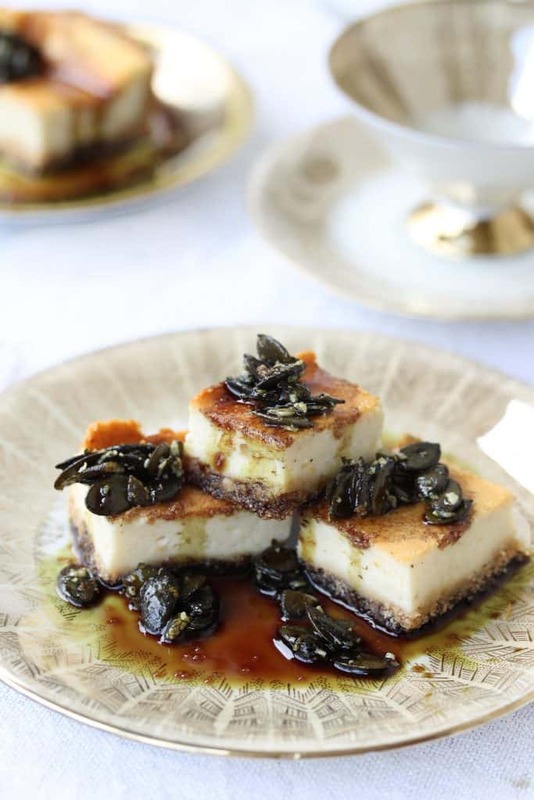 Garnish the cooled cheesecake with the crumble and the pumpkin seed sirup mixture & ENJOYY ! !